Michael Oren is the author of numerous critically acclaimed books, including Six Days of War. An American-born Israeli historian, author, politician, and former ambassador to the United States, Oren is a current member of the Knesset for the Kulanu party and Deputy Minister in the Prime Minister’s office. I had the pleasure of conducting one long telephone interview with the Deputy Minister as well as enjoy a private group meeting with him at the Knesset in Jerusalem during which he addressed the Philos Project study group of which I was a part. We were in Israel to study the Six-Day war and the modern Middle East. On the eve of the 50th anniversary of the Israeli victory, Oren discussed the history and historic significance of the event. Oren is an exceptional historian, one who has managed to earn the admiration of historians across the Middle East ideological divides. In the dead of night, on the last day of 1964, a 35-year-old former engineer from Gaza named Yasser Arafat led a squad of al-Fatah guerillas from Lebanon into northern Israel. Bearing Soviet-made explosives, and donned in Syrian-supplied uniforms, their target was a pump for conveying Galilee water to the Negev desert. This nighttime raid, al-Fatah’s maiden operation, would be a spectacular flop. Not only would the planted explosives fail to detonate, but the terrorists would be arrested by Lebanese police as they attempted to slip back across the border. Oren admits one might wonder at the “singularly limber imagination” required to believe such petty sabotage, even if successful, would somehow ignite a full-scale war. Yet, as he asserts, “al-Fatah’s operation contained many of the flashpoints that would set off precisely such a war less than three years later.” Among much else, “there was, of course, the Palestinian dimension, a complex and volatile issue that plagued the Arab states as much as it did Israel. There was terror and Syrian support for it and Soviet support for Syria. And there was water.” Water won’t feature much in the essay below, but feature large it did, indeed, in the buildup to the war in 1967. By the beginning of 1964, Arab leaders were concerned about Israeli plans to channel Galilee water to the Negev desert in southern Israel. An irrigated Negev, the Arabs feared, would support millions of additional Jewish immigrants and further solidify Israel’s presence in Palestine. Arab leaders responded with the Headwaters Diversion Plan, an effort to stem two of the three sources of the Jordan River and prevent them from entering the Sea of Galilee—and so drastically reducing both the quantity and quality of the water available to Israel. Against such a threat, rightly characterized as existential, Israel could not remain passive. Several such potentially existential crises would manifest prior to 1967 and would begin to bracket Israel’s sense of available options, until her preemptive strike against Egypt became the inevitable outcome. And so a seemingly minor act of terrorist aggression contained within itself all the tinder necessary to set a region alight. When this conflagration did ignite, it would rage for less than a week, but would change the region, its people, and global politics forever. 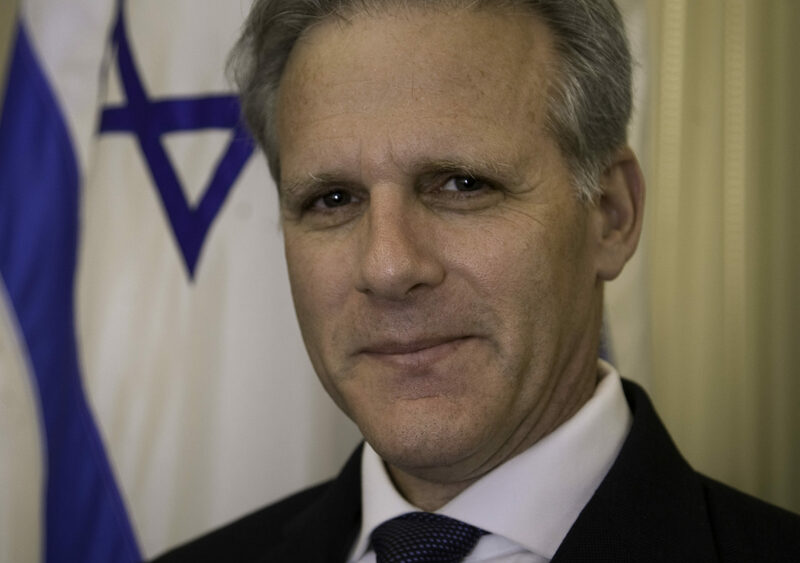 Deputy Minister Michael Oren is an American-born Israeli historian (PhD, Princeton), writer, diplomat, politician, and combat veteran. He served as the Israeli ambassador to the United States from 2009-2013, entered the Knesset and the governing coalition in 2015 as a member of the centrist Kulanu, and is now deputy minister for public diplomacy in the Prime Minister’s Office. The following interview is primarily drawn from two sources: an initial phone conversation with the deputy minister in late April, and then a private address to our Philos Project tour group—in Israel to study the war and the modern Middle East—that Oren delivered in the Israeli Knesset in May, on the eve of the anniversary of the reunification of Jerusalem. I also draw from Oren’s Six Days of War. Lengthy material taken from this book is set apart in quotation marks. Providence: Before setting up the context of the war, I’d like to begin with a personal moment. In your book, you recall your early memories of the Six-Day War, listening to the event on the news, your parents’ response, and early fears that gave way to elation. Michael Oren: Yes. No event had a greater influence on me than the Six-Day War. I was 12 years old. The beginning of the crisis coincided with my birthday. There wasn’t a lot of celebrating. My parents feared for what they believed was Israel’s imminent destruction. They feared a second Holocaust was about to occur. They believed that the world was again going to do nothing. To witness it silently. And then came June 5th. Israel’s victory in the war that followed allowed American Jews to walk with their backs straight, and they could now flex their political muscles. That’s what was said. “American Jewish organizations that previously kept Israel at arm’s length suddenly proclaimed their Zionism. For me, personally, the war’s impact was especially poignant. I will never forget my father rushing to the breakfast table, waving a copy of Life. On its cover was a photo of an Israeli soldier chest-deep in the Suez Canal, a captured Kalashnikov brandished over his head. ‘You see that!’ he shouted. ‘That’s what we can do!’ And he kissed the picture.” I decided then-and-there that I was going to move to Israel. Prov: That’s right—you moved to Israel, as you wrote, to “take part in the drama of Jewish independence.” And it’s been a drama, with no guarantees. I’m particularly struck by the idea that Jews feared a second Holocaust. The rapidity and decisiveness of the Israeli victory in ’67, makes it easy to forget that, in the buildup to the war, the Jewish people really thought Israel was facing an existential threat. Despite the victory, this fear wasn’t misplaced, was it? Oren: Not at all. There was every reason to believe Israel was facing an existential threat. This is widely forgotten. To understand the Six-Day War you have to take a snapshot of Israel on June 4th, 1967. What did this country look like? The Middle East? The world? Israel is nine miles wide at its narrowest. It has a population of 2.7 million people, many of whom are traumatized. Many had survived the Holocaust; this is just 20 years after Auschwitz. Many were refugees of oppression in Arab lands, from which they fled or were driven out. Israel is surrounded by 639 miles of hostile neighbors with whom it is in a state of war: Lebanon, Syria, Jordan, and Egypt. These enemies don’t just threaten to attack Israel, but to drive it into the sea. The West Bank was annexed by Jordan in 1950, Gaza has been under Egyptian military occupation since 1948. Jerusalem is divided. There’s a wall right across middle of the city. Arab snipers regularly pick off Jews on the other side of that wall. Old Jerusalemites all know people who were shot by snipers. There was no access to holy places for Jews, above all the Western Wall. Divided. Israeli farms, in Israel, in the north, are constantly being shelled from Syrian positions on the Golan Heights. The Arab world is divided in two big ways, and then several small ways. It is divided between the Arab radical states—Algeria, Iraq, Syria, and Egypt, and the conservative monarchies—Jordan, Saudi Arabia, Morocco, many of the Gulf States. The conservatives are backed by the United States, the radicals by the Soviet Union. Within each camp, they all hate each other. Egyptian president Gamal Abdel Nasser is the ostensible leader of the radical camp, but he’s in competition with the Syrians, who are in competition with the Iraqis. The Jordanians are in competition with the Saudis. But for everybody, the way you win this competition is to show you’re the most anti-Israel. One Arab state pushes the other Arab states to do something against Israel increasingly radical. So you have an Arab-Israeli conflict, which has several concentric circles to it. I’ve already mentioned the inner-circle, the Arab border states. There’s an outer circle, as well. This includes Iraq, the Gulf States, and the North African states. They’re not on the frontline with Israel, but they can send forces. In 1948, Iraq did send forces, and they fought in Jerusalem. Militarily, “the Arab’s combined outlay on arms—$938 million annually—was nearly twice that of Israel.” And Egypt and Syria hold key terrain: Egypt can blockade Israel’s Red Sea port, strangling our economy, and Syria can stop the flow of water into the Galilee. These, too, are existential threats. This is important to keep in mind because the generation that ran Israel in 1967 kept it in mind. Into this mix you throw a couple of Palestinian terrorist outfits, which are always causing trouble. You have the Palestine Liberation Organization, which is created by Nasser in 1964 to advance Egyptian interests; it’s a straw organization. You have this tiny organization called al-Fatah, headed by one Yasser Arafat. It’s backed by the Syrians and operating out of the West Bank for the most part, or off the Golan Heights. They don’t have an enormous impact, but what they’re good at is ratcheting up the aggression against Israel and getting the Israeli army to retaliate, usually at the Jordanians or the Syrians. In turn, the Syrians and Jordanians strike back. And Israel doesn’t sit passive. You can see how this escalates. In the world, Israel is more isolated than it has ever been or ever will be. China, India, all hostile. The Soviet Union, very hostile. The Soviet Bloc of 12 Central and Eastern Europe, hostile. The United States is friendly, but not an ally. There’s no strategic alliance, no military support. Internationally, Israel has one ally. That’s France. And on the eve of the Six-Day War, France switches sides. Threats to annihilate us, utterly alone, out-gunned. The Israeli leadership is convinced that we were literally on the eve of a war of destruction. Israeli government digs about 10,000 graves in a Tel Aviv park and is convinced it’s not going to be enough to hold all the bodies. After the war, I read Robert Littell’s If Israel Lost the War. “It left me sleepless for nights. In vivid prose, the author describes endless columns of burned-out Israeli tanks and trucks, thousands of destitute POWs, and widespread massacres of Jewish civilians. Especially haunting for me was the final chapter in which Nasser’s helicopter flies over the ruins of Tel Aviv, and Moshe Dayan is placed in front of a firing squad.” That book had a very powerful effect. It captured the mood of the times. Prov: You mentioned Egypt’s ability to blockade Israel’s Red Sea port. Of course, Nasser actually does exactly this, a major factor precipitating the Six-Day War. Yet in reading your book, I came away with the impression that, perhaps, Nasser didn’t want war as much as he simply wanted the fruits of war. While he pledged, repeatedly, to destroy the Jewish state and drive its people into the sea, one doesn’t get the impression of a rabid anti-Semite. Did he hate the Jews? Were they simply a scapegoat for some larger inter-Arab dispute? Did he blunder into war? Was he pressured into it? Oren: I think it was a combination of those factors. I don’t think Nasser thought Israel was going to attack, even after blocking the Straits of Tiran. He lost control. Inter-Arab feuding certainly factored in, he was in competition with the Saudis. He was Arab Nationalist but also a radical, and there was, as I’ve said, a huge battle for leadership of the Arab world. Go back to late 1966. A Palestinian terrorist organization carries out an attack from the West Bank, from a village called Samu′. Israeli forces retaliate, cross into the West Bank, and run, by accident, into a battalion of Jordanian infantry. A lot of Jordanians got killed. Jordan’s King Hussein blames Nasser for not standing up to the Israelis. Another Palestinian terrorist organization carries out an attack from the Golan Heights and, in March of 1967, Israel retaliates against the Syrians. The Syrians shell the Galilee, Israel sends up its air force to hit the emplacements on the Golan, the Syrians send up their air force, and the Israelis end up shooting down six Syrian MiGs. In 30 seconds, they achieve air supremacy over Damascus. The Syrians blame Nasser for not standing up for the Arab cause. Then there is the interference of larger global players. For reasons up for conjecture, the Soviet Union begins spreading rumors that Israeli troops are massing on Syria’s border in preparation for war. The Egyptians know full well that this is not true, but by May 1967, Nasser is already in hot water, and is feeling pressure to act. He needs to do something symbolic that’s going to reestablish his leadership of the Arab world. What does he come up with? He decides to evict the United Nations Emergency Force (UNEF) from the Sinai, where they had been placed at the end of the Suez crisis in 1956. Now, as far as Nasser was concerned, the fact that there was an international force in the Sinai did not derogate from Egypt’s sovereign rights. UNEF was there at the sufferance of Egypt, it wasn’t imposed on Egypt. But in May, Nasser evicts them. UN Secretary General U Thant buckles quickly, and, basically, within 24 hours the first peacekeeping force in history abandons its mission. They are kicked out. Nasser sends his army into Sinai. He marches them in daylight. This is very important because, according to the documents I read later on, he did this on purpose to signal to the Israelis that he did not want war. It was all done publicly. He wasn’t sneaking anyone in. Nevertheless, what’s clear is that Nasser has suddenly just remilitarized the Sinai. He brings his army up against Israel’s. There is no buffer anymore. This creates huge war fervor among Arabs. Demonstrations occur throughout the Arab world urging the destruction of the Jewish state. And so Nasser feels he must take another step. On May 22nd, he closes the Straits of Tiran, the portal between the Red Sea and the Indian Ocean, about a mile and half wide. If you close them to Israel-bound shipping, you effectively neutralize Israel’s southern port of Eilat, and eliminate Israel’s exit to Asia. Israel got all its oil through Eilat—so if you blockade the strait you’ve cut off Israel’s oil supply. Not good. The blockade is an act of war. More war fervor, the Syrians, the Iraqis, quickly sign a mutual defense pact with Egypt, and suddenly everyone is talking war. Jordan’s King Hussein is Egypt’s archenemy. Nasser’s tried to assassinate him no less than 11 times. But Hussein gets on an airplane and goes to Cairo. Nasser meets him at the airport and tells him, “I could kill you.” And Hussein replies, “You could kill me, but I’ve come here to put my army under your command.” So the Egyptian army takes command of the Jordanian army and, you know, the Jordanian army is, then, right here in Jerusalem—just up the road, about a mile from here. This is all happening in a very short period of time. As I said, Israeli leadership believes we are on the verge of a fight for our lives. They issue gas masks, dig graves. The Knesset sends messages out to the international community for help. The only leader who responds is President Lyndon Johnson, who says, “Listen, I’d love to help but I’m bogged down in a war.” Remember, at this time there’s no strategic alliance between the United States and Israel, there’s no obligation there. “But what we’ll do,” Johnson says, “is form an international convoy made of 26 ships from 26 nations and we’ll sail them through the Straits of Tiran. If the Egyptians open fire at us we’ll open fire back at the Egyptians.” They even picked the targets they would hit. The only problem is that no other country was willing to contribute a single ship. Even the United States Congress was against it. Even Israel’s friends in the US Congress were against it. Nasser wasn’t anti-Semitic. He had had extensive contacts with Israelis in the 1948 war. He’d conducted truce negotiations, corresponded with the Israelis in the early 1950s; he was always willing to talk directly with Israel. So there wasn’t out-and-out hatred. Simply, waging war against Israel or appearing to wage against Israel is what established legitimacy. The big problem with Arab countries then, as today, is legitimacy. You saw in the Arab spring what happens to countries without legitimacy. It’s not by accident that the only countries who survived the Arab spring are the monarchies; they can trace their legitimacy back to prophet Mohammed. Without legitimacy, governments are swept aside. It wasn’t any different in 1960s. Prov: There’s a real tragedy there. If Nasser didn’t want the war, who did? Oren: Not at all. It’s important to know, crucial to know, that Israel tried again and again to warn Arab leaders that they didn’t want a war. Israel sent messages on back channels to the Syrians, to Nasser, saying “We don’t want war. Let’s climb down the ladder.” Personal letters were sent back-and-forth to King Hussein saying we don’t war. Nothing happens. Arab armies continue building up on Israel’s door. There followed a three-week period of high tension, the most nerve-wracking, traumatic weeks. Nowadays we have mothers protesting against war; back then they were protesting for it—they could not bear the fact that their husbands and sons and brothers had been mobilized in the reserves. We were an agrarian economy back then, and no one was picking the fruit, mowing the alfalfa. The economy was in a nosedive. The joke was, “Would the last person out of the airport kindly turn off all the lights?” The thought was that people would just start fleeing. All this sets in motion a series of events that are truly inexorable. History has taught the Jewish people that despite Israeli self-defense coming at significant economic, diplomatic, and human costs there is not, nor has ever been, any practical or moral alternative. Her tactic is deterrence. Her strategy is to survive. Negotiations leading to peace can be realistic with an adversary who shares that goal. What do you do with enemies who seek only your annihilation? You cannot, in the immediate term or until dispositions change, induce them to peace. But you can deter them from war. We must make the cost of aggression too high to pay. Israeli leaders made a decision to have a very limited preemptive strike. It had only two goals. One, neutralize the Egyptian air force. Egypt had about 400 Soviet planes; this was an existential threat. The other goal was to attack and capture the first of three of the defensive lines in the Sinai and so move the Egyptian army back. That’s it. Moshe Dayan, the Defense Minister, even warns the generals that he will personally shoot the first Israeli soldier to reach the Suez Canal—he so did not want to reach the Suez Canal! Providence: So, what happened? How did you go from limited objectives on the morning of Operation Moked (Focus)—the Israel Air Force assault on the Egyptian airfields—to the situation six days later in which Israel had quadrupled the territory under its control, to include all of Sinai and the Suez Canal, Gaza, the West Bank, the Golan, and, of course, all of Jerusalem? The imponderables and the unpredictable happens! First, the Egyptian air force is destroyed in two hours—it’s the greatest air victory in military history, studied to this day—350 Egyptian planes destroyed in about an hour and a half. Three Israeli columns enter Sinai. The northernmost one is unexpectedly shot at from Gaza. There was no plan to conquer Gaza; Gaza was out of it. But there was an Egyptian force there with Palestinian irregulars, and they start shooting. So, the Israelis do a little side move, and they enter Gaza. And there’s fighting—which wasn’t planned. Meanwhile, the Israeli lines hit that first Egyptian defensive line, which breaks so fast that the three Israeli columns proceed to hit the second and third Egyptian lines, and they break fast as well. The Egyptians begin a helter-skelter retreat toward the Suez Canal. Officers take vehicles and abandon their men. Some have to flee on foot, so they took off their shoes and ran across the dunes of Sinai—because you can’t run across those dunes in shoes. Most significantly, Jordanian ground forces began entering the city, over near the Haas promenade. Most Israelis had lived through the 1948 War of Independence. The Jordanian army beat the Israeli army in every single battle, every one. They are perceived as a major threat. In 1948, they also laid siege to West Jerusalem, leaving 100,000 Jews without food or water. A deep scar. They move into West Jerusalem? Another existential crisis. Israel is going to react. The Israeli air force takes an hour to destroy the Jordanian air force. Israeli ground forces begin to counterattack, in Jerusalem and the West Bank. No plans for this. There were no paratroopers here; they were down in Sinai getting ready to parachute into El-Arish. All of a sudden they’re redirected to Jerusalem, to fight in a city they don’t know. “They had rarely trained for urban combat and lacked maps and aerial photographs of the battleground.” But they got on buses, and they came. The greatest number of paratroopers killed and wounded in Jerusalem were killed and wounded getting off those buses, hit by artillery. It’s a nightmare. Another Israeli armor column enters the West Bank through Latrun, an old British fortress. Their main goal is to get to Mount Scopus, an Israeli enclave demilitarized for 19 years. The Jordanians have 100 M-60 Patton tanks, the largest tanks in the Middle East at the time. Israel had nothing that could stop it. The tanks had left Jericho and were moving up toward Jerusalem. The fear is that they were going to overrun Mt. Scopus. They, too, get taken out by the Israeli air force. Most never got to Jerusalem. Throughout the West Bank the Jordanians fight hard. But June 6th, June 7th, they begin to retreat. Israel is sucked into the West Bank, up against the Jordan River. Israeli paratroopers surround the Old City. On the morning of June 7th, they’re prepared to go in. Think about that. On Jerusalem Day, we walk through the Old City with flags, celebrating the reunification. In 1967, the Israeli government was willing to forgo, willing to forfeit, that historic reunification of the Jewish people with its holiest sites in order to have peace with one Arab country. King Hussein never responds. Israeli paratroopers enter the Old City at about 9 a.m. Two hours later they report, “The Temple Mount is in our Hands,” and the war is essentially over on the Jordanian front. What’s left? Syria. Like the Jordanians, they get a message from Cairo on June 5th to open fire, and they do so, massively, from the Golan Heights, firing tens of thousands of shells down on Israeli farms and villages. Israel fires back, but the decision was made to not open another front. Additionally, the Syrian regime was particularly close to the Soviets, and Israel didn’t want a tussle with the Soviets. That said, by the end of the first day of the war, “Syria had little air force left. Two-thirds of it…had been eliminated in eighty-two midday sorties.” Three enemy air forces destroyed in a single day. Even up to June 8th, the “Syrian shelling of kibbutzim and settlements in Israel [had] been continuous and incessant…forty-eight of them were hit.” The two other fronts had stabilized and the Syrians were still fighting. So, what choice was there? We gotta go up there and get rid of them. Now we have the opportunity. So, on June 8th we open a third front. The fight for the Golan Heights was a very tough fight. Prov: You’ve said somewhere that Israel wins all its wars but it never wins the peace. ’67 in some ways fits that pattern. This can be see, perhaps, in what you describe as a move from what was generally regarded as an Arab-Israeli conflict, prior to 1967, to one described afterward as an Israeli-Palestinian conflict. With this shift came something of an inversion of the public perception of the power dynamic in the Middle East. In the Arab-Israeli conflict, power was perceived as resting with the Arabs. After ’67 proved this wrong, power is now perceived to be on the side of Israel, and it is the Jews who are seen, by many, to be the aggressors. Oren: Right, the David and Goliath thing. That’s true, but the analogy is predicated on an outdated notion of what power is. No, Israel doesn’t face a conventional military threat vis-à-vis the Arabs. Not anymore. But it faces all kinds of different threats. Hezbollah and Hamas rockets in the north and south respectively can render life emotionally untenable. Their rockets are now capable of hitting every part of our country, taking out our airport, freezing the economy, and spurring a mass exodus. Not to mention emboldening other adversaries into joining the assault. Add to this suicide bombers. Add to this the delegitimization and boycott campaigns in intellectual and academic circles and the press—all of which is political warfare. Add the Iranian nuclear threat. Beyond proliferation and first-strike threats—which they have vowed to do—the possibility exists that the Iranians would transfer their nuclear capability to terrorist groups. There are still existential threats. This is what I mean when I say that wars in history become wars of history. There will be some on the extreme left, within Israel, who agree with the Palestinians in calling the ’67 war a great catastrophe—because it resulted in the occupation and settlements. But events have been unkind to this view. The watershed was September 2000, the outbreak of the Second Intifada. It followed an offer by Ehud Barak and Bill Clinton to Yasser Arafat of Palestinian statehood—of all of Gaza, almost all the West Bank, and half of Jerusalem—Israel offered to re-divide Jerusalem. In return for that offer we got war. We didn’t get peace; we got war. For an entire generation of Israelis, who believed that the Israeli-Palestinian conflict was all about the results of 1967, this was a profound shock. They suddenly realized the conflict had just as much to do with 1917, 1937, and 1947. In 1917, a century ago this November, Britain issued the Balfour Declaration, pledging to create a national home for the Jewish people. It didn’t commit to creating a Jewish homeland in all of Palestine. The national home could have been tiny. The declaration also promised to maintain the civil and religious rights of existing non-Jewish communities. Nevertheless, the Palestinians rejected the Declaration; they vowed never to accept such a Jewish nation. And so, in the 1920s, when the declaration was followed by a wave of Jewish immigration, Palestinian Jews were murdered in Arab riots that eradicated the ancient Jewish communities of Hebron and Safed. The Israeli-Palestinian feud is also about 1937, when Zionist leaders under David Ben-Gurion supported the Peel Commission—which presented a plan to divide Palestine into separate Jewish and Arab states. But once again, while the Jews recognized the Palestinian Arabs as a people with sovereign rights, the Arabs didn’t return the favor. Not only did they reject the plan, they successfully pressured Britain into cutting off almost all Jewish immigration to Palestine, denying European Jews of their last escape route from Hitler. So the Second Intifada demonstrated that Palestinians were not going to accept Israel on any borders. That was a profound shock to the left, one from which the Israeli left has never recovered. It was reinforced in 2005 with the disengagement from Gaza. Israel ripped up all the settlements, ripped up 21 settlements and moved back to the 1967 lines. It didn’t get peace. It got Hamas—and tens of thousands of rockets. These are shocks from which the left has never recovered. Prov: Right, and to go back to 1948, while Arab fighting was certainly directed at destroying the Jewish people, it was never, apparently, also directed at providing a homeland for the Palestinians. But after ’48, there was no reason the Arabs couldn’t have given Palestinians a homeland. Oren: Well, this is why—and this might surprise you—the biggest winners of the ’67 war were probably the Palestinians. Think about it. Before ’67, what was the situation? Jordan had illegally annexed the West Bank. Egypt militarily occupied Gaza. No one was talking about a Palestinian state; no one was talking about Palestinians at all. Usually if you referred to a Palestinian prior to 1967, you were referring to a Palestinian Jew prior to the establishment of the state. I have in my office several copies of Life magazine from the 1960s, early 1970s. Even in the early ‘70s, when you’re referring to a Palestinian, it means you’re referring to a Palestinian Jew pre-1948. At the 1939 World’s Fair in New York, the Palestinian pavilion was the Jewish Zionist pavilion. You went in and got genuine Palestinian food, Palestinian art. It was all Jewish. The 1947 partition resolution talks about creating an Arab state and Jewish state, not a Jewish state and a Palestinian one. The terrorists that were Palestinian terrorists were then simply called Arab terrorists. What happened, then, is that the ’67 war reunited the three major centers of the Palestinian population—Gaza, the West Bank, and Israel—and brought them under one rule for the first time since the British mandate: Israel’s rule. The result was a huge infusion of Palestinian identity. But not just that, the Palestinians, who before the war worshipped Nasser, didn’t worship him anymore. The ’67 war disabuses the Palestinians of the belief that they can look to Nasser, or Arab Nationalism, or any state to bring about their redemption, and they begin to look to themselves. It’s no accident that only two years after the ’67 war, the PLO, which was a shell organization, emerges as a significant Middle East player. It becomes a Palestinian organization, an umbrella for many terrorist groups—they all unite under the PLO. Yasser Arafat, by 1969, is its head. Prior to this, Arafat wasn’t even a member of the PLO, he was in a rival organization—Fatah. All of this changed because of 1967. Five years later, Arafat is getting standing ovations at the UN General Assembly. All of a sudden, the world is talking about a Palestinian problem. No, prior to ’67, no one was talking about a two-state solution. Certainly not the Arabs. Two state solution for the Palestinians? You kidding? Prov: What are the other significant legacies of ’67? Oren: “The collapse of pan-Arabism and its replacement by Islamic extremist ideas.” Arab nationalism and Islamic fundamentalism, jihadism, have been in a contest since the mid-19th century. The founding fathers of what would become the Muslim Brotherhoods, basically all the purist movements, even ISIS, find their roots in the Egypt of the 1870s to 1880s, the same formative period of Arab nationalism. The competition was this: the nationalists said the reason we are weak is because we don’t have what the West has; we don’t have nationalism. The Islamists said we’re weak because we’ve ignored our own roots, so we have to go back to our own roots. In a certain way, the Arab nationalists were more flexible because of an essentially secular ideology. Not that that made them very pleasant to deal with; Saddam Hussein was an Arab nationalist. Bashar al Assad is an Arab nationalist. Nobody has ever accused him of being a nice guy. But if you have to choose between ISIS and an Arab nationalist, you might consider an Arab nationalist. The war also inaugurated the emergence of the US-Israel Strategic alliance. It didn’t exist before the Six-Day War. On the seventh day, American policymakers woke up and said, “Whoa, there’s this little superpower out there that’s democratic, and pro-American. Maybe we should have a strategic alliance with that country.” That’s where it begins. Keep in mind, prior to ’67, not only had no president ever been here, but no Israeli prime minister had ever been to the White House. Kennedy met Ben-Gurion, one time, in the Waldorf Astoria in New York, not in the White House. Founder of this country, he was not even greeted in the White House. What we consider today commonplace was, back then, simply non-existent. Today, that alliance is probably the deepest, most multifaceted strategic alliance that the United States has with any foreign power; I say that without reservation. Note just one facet: the Israeli army is more than twice the size of the British and the French armies, combined. And it just happens to be located at the most strategically sensitive and valuable intersection on earth. That’s why the American military is nowhere near here. No bases. No fleets. You don’t need it. You’ve got us. It is an immense asset to American security, and America is an immense asset to Israeli security. So it’s a very deep alliance. It emerges from the start of the Six-Day War. It will probably only get stronger. Prov: What does the reunification of Jerusalem mean for Israel? Oren: Jerusalem is the political and the spiritual capital of the land of Israel, of the Jewish people. Ben-Gurion understood this at the state’s creation in 1948. Even with large sections of the Galilee and the Negev already lost, he devoted the bulk of Israel’s forces to breaking the siege of Jerusalem. He understood the city is the soul of the Jewish state. Prior to ’67, the state of Israel was not particularly located in biblical lands, but after ’67 it was. Haifa’s not in the Bible! Hebron, Jericho, Bethlehem—these are. The ’67 war, Israel’s victory, makes the Jewish state palpable. It makes the Jewish state more Jewish. Prov: In the days leading up to the Six-Day War, songwriter Naomi Shemer wrote “Jerusalem of Gold” for Israel’s 19th Independence Day. With its primary theme of exile and longing for Jerusalem, it became something of an unofficial national anthem. After the war, a paratrooper wrote “Jerusalem of Iron,” a song based on Shemer’s song but capturing a different mood. Oren: Meir Ariel—I’m a big fan. He was a poet and a singer. And, yes, he was a paratrooper in 1967. He was disgusted by the war victory fervor that swept over the country. His reaction to this was to write this song, “Jerusalem of Iron,” or steel, to talk about the pain. There are other songs like this. “The Song of Peace” is a threnody for the recent dead. In it, the dead talk to the living, saying don’t celebrate war, look at what it did to us. In Israeli society, there is always this tension—the desire to celebrate and a remembrance of what the war cost. Israel lost about 750 soldiers in the war. In a country as small as Israel, it was a large loss—the equivalent, in America today, of about 80,000 people. Such losses were proportionally higher than the Yom Kippur War. Tens of thousands of Egyptian dead. Significant losses in Jordan and Syria. “Large numbers of noncombatants suffered, and suffered acutely. Between 175,000 and 250,000 Palestinians fled the West Bank for Jordan, many of them second-time refugees.” So, there was a tension. This doesn’t take away from the understanding that the ’67 war was a great victory. Prov: Yom Jerusalem, Jerusalem Day. We’re going to be out on the streets in the thick of it. What should we expect? Oren: To be on the streets of Jerusalem on Jerusalem Day, on the 50th anniversary of the reunification, will be an extraordinary scene. Thousands and thousands of Israeli youth will be marching, dancing, with the Israeli flag. See, Israeli young people are what would be considered in an American context right wing. In contrast to the United States, you can be very cool in this country and right wing! In particular, religious youth will be out. Go to the Kotel. For the religious Jews, as for many evangelicals, the ’67 War is perceived as being an act of Divine intervention having millennial ramifications. It will be very moving.